Being in the tech field I often get to speak to lots of engineers who explain to me they aren’t swayed by advertising. Quite often they tell me they don’t think people in general are swayed either. What they do is project their personal feelings on a broad population which is normal. Many of these engineers run tech companies which typically don’t do so well. This group would likely be fascinated to learn that Samsung’s success these past 12 months have been extraordinary and much of the credit goes to – sit down and take a deep breath… Advertising! Remember, Samsung doesn’t even control the OS they sell. You could argue they have superior products but for the most part many Android phones and tablets are quite similar. 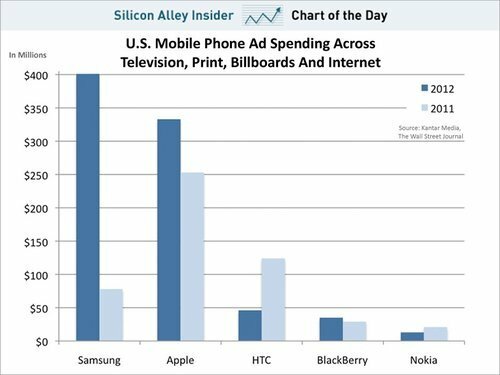 Business Insider has a great chart showing how a jump in spending in one year has rocketed the company to the top spot in the smartphone mindshare race. Moreover, the company is now spending $4B worldwide on ads.